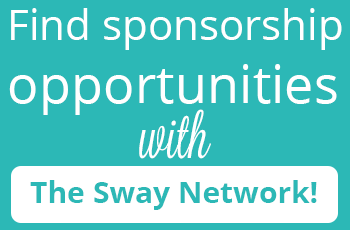 Have you been considering reaching out to the media to provide more exposure for your blog? Have you been getting requests from the media looking for more information about your blog, but you’re not sure how to package it for them in the most effective way? Enter the media kit: once a traditional staple of public relations and marketing, the media kit has evolved in a new era of blogging and social media to become a powerful tool in your blogging strategy. When my blog garnered international attention overnight in April 2011, I realized I desperately needed a knockout media kit to help my blog more effectively tell my story. When I rebranded in March of this year, my media kit was essential in establishing my new brand identity. Sometimes referred to as a press kit, your media kit consists of promotional materials about you, your blog and your brand. Your media kit is contained in one neat package that can be used to bolster your pitches to media outlets or accompany important announcements and newsworthy items about your blog or brand. As a blogger, there are key pieces of information about your blog you want to make sure you share with prospective media partners. Sometimes media outlets want to get to know a little more about you before they approach you to see if you’re a good fit for their story needs. Having a media kit ready to go right on your blog makes your blog that much more friendly to journalists and producers. You should also consider your media kit as a helpful tool for interested brands who seek to work with or advertise on your blog, giving them insights on your readership. I consider the following items in the next section essential in any media kit I create, either for myself or other clients. Current headshot: Media partners and prospective advertisers want to see the face behind the blog. You don’t have to have your headshot professionally done; just make sure your face is clearly visible and you are well lit in your photo. Your bio: Your media kit is your personal introduction to media outlets. 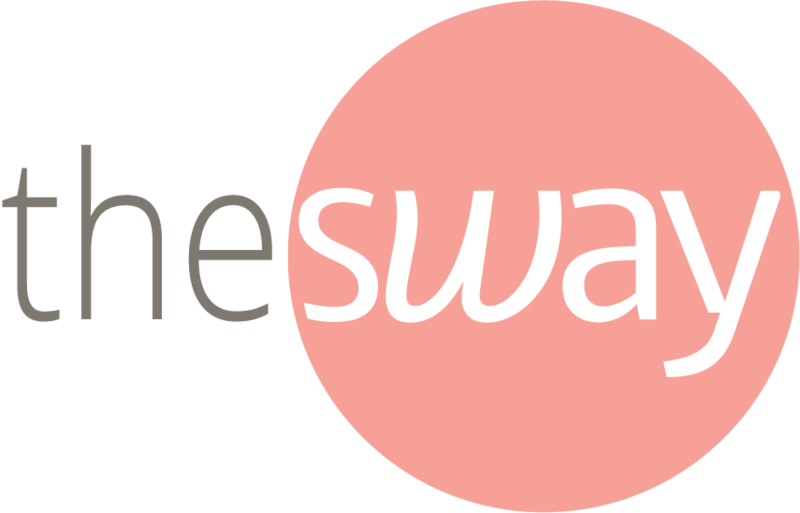 Web, print and TV journalists are on the lookout for compelling stories, so really take the time to tell prospective members of the media exactly who you are and what your blog is all about. Wrap it all together in a concise bio that sells the uniqueness of you and your blog. Website traffic statistics: You are running Google Analytics or some kind of website traffic monitoring on your blog, right? 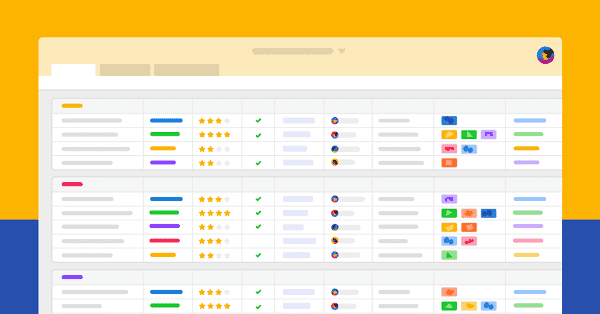 You’ll want to pull key stats such as overall lifetime visits to your blog, monthly unique visitors, and new versus returning visitors. 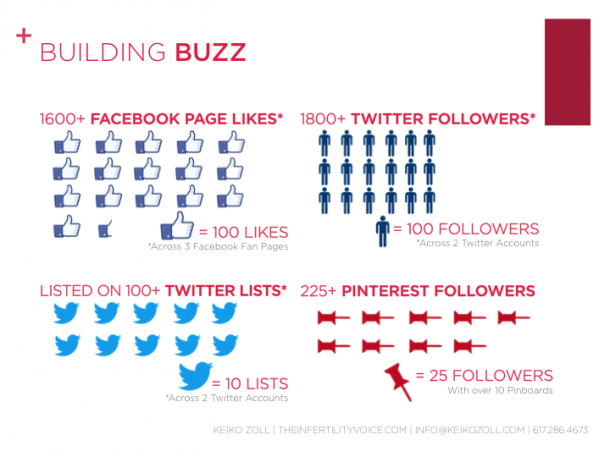 Social media presence: Are you on Pinterest or Facebook? How about Twitter? If you’ve been racking up the fans and followers for years, your media kit is the perfect place to let those fan numbers shine. Don’t be afraid to brag: if you have 1,000+ followers on any social media platform, you absolutely have the right to toot your own horn! This also helps media outlets evaluate your credibility and determine if you have the social media influence to spread the word about their forthcoming story. Readership demographics: Who’s reading your blog? Again, using data from Google Analytics, let media outlets know from where your blog readers are coming. 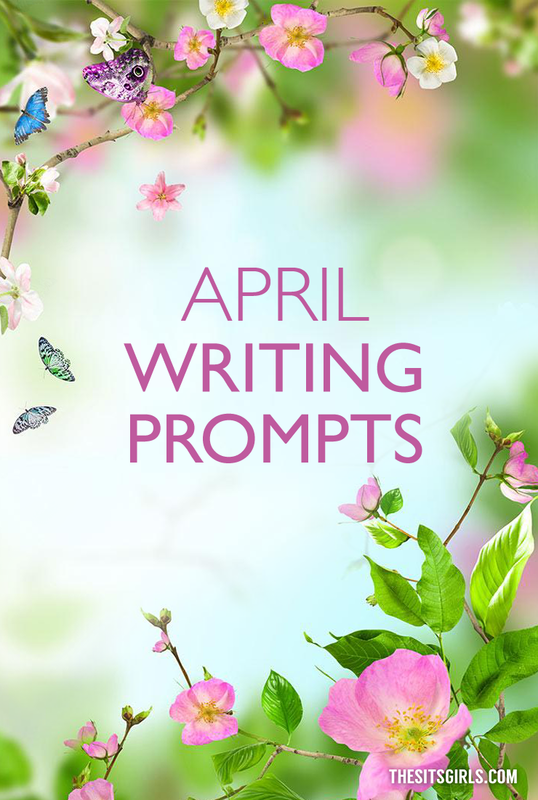 It’s also helpful to step back and take a look at both your domestic and international readers, as you never know what international outlet might be interested in your blog. It also helps to know your readers’ genders, ages groups, marital status and if they have children. Having your readership demographic information handy is absolutely vital to working with brands and advertisers. Press clippings or media features: Have you already been featured in your local paper or TV station? 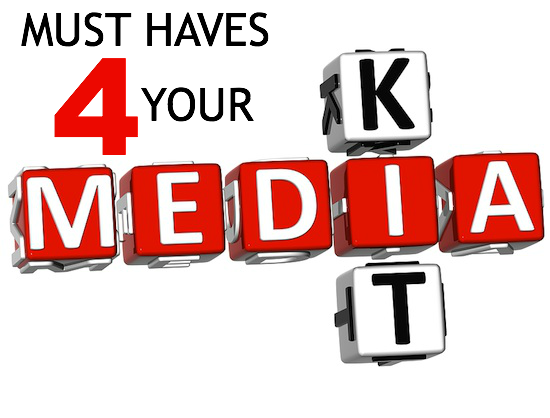 Your media kit is THE place to demonstrate your media readiness. List any media outlets or stories in which you’ve already been featured; these only add clout to your reliability as a media source. If you don’t have any press clippings yet, don’t worry – everyone has to start somewhere. Awards, honors and other testimonials: If you or your blog have been winning awards for the work that you’re doing, you should absolutely shout this from the mountaintops within your media kit. Having real testimonials from blog readers makes your blog a trustworthy, reputable resource. Current, accurate contact information: When you’ve got a reporter on a deadline, they need to be able to get in touch with you. Your contact information including name, cell phone number, email and address should be on every page of your media kit. If you’ve not comfortable giving out your cell phone number or publishing it publicly on your blog, consider getting a free Google Voice number and have it forward to your cell phone. A clear headshot with my bio. Overview of social media presence. 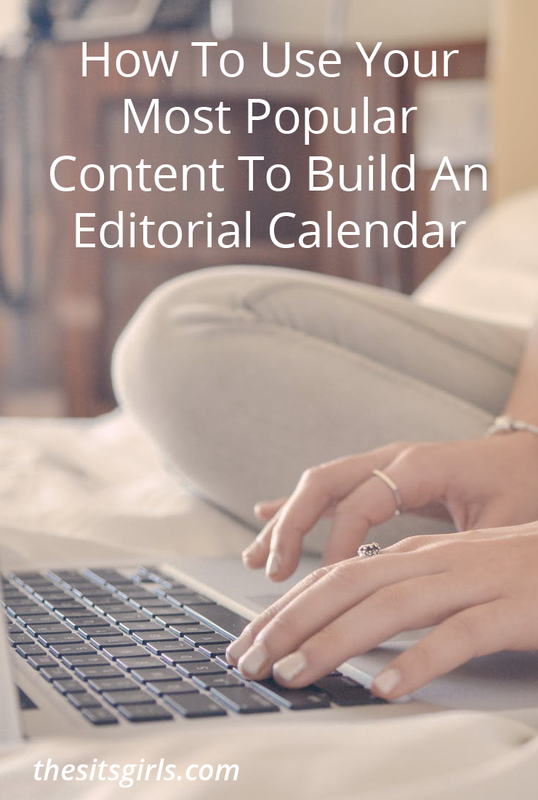 Once you’ve gathered all of your knockout copy to sell the newsworthy high points of your blog, it’s time to put it all together in a sleek package that’s easy for media outlets to digest. No matter how you compile your media kit, the visual design should reflect your brand identity: stick to the same color families, fonts and overall visual design as your blog. Don’t forget to include your logo! You can create your media kit in a variety of programs such as inDesign or Photoshop. 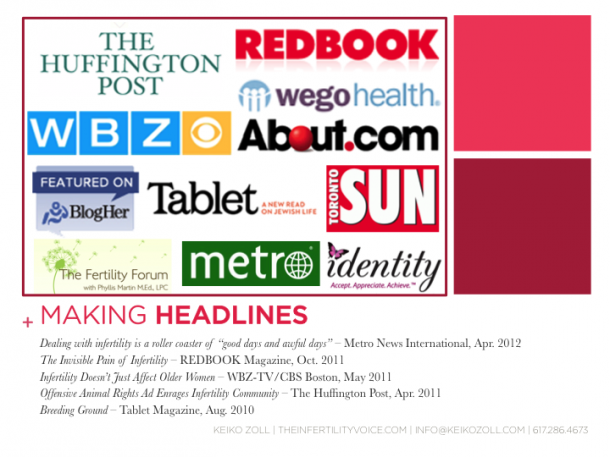 I made my media kit for The Infertility Voice entirely in PowerPoint. What can I do with my media kit? Once you have it designed the way you like it, save it as a PDF file and upload it to your site. Link it somewhere prominent. If you’re pitching a media outlet for a story, make sure you attach your media kit in addition to your pitch. It’s a good rule of thumb to update your media kit quarterly so that you’re sending out the most current, accurate data about your blog. Now that you’re ready to put all these elements together to tell your blog’s unique story, you’re on your way to creating a stellar, knockout media kit of your own! 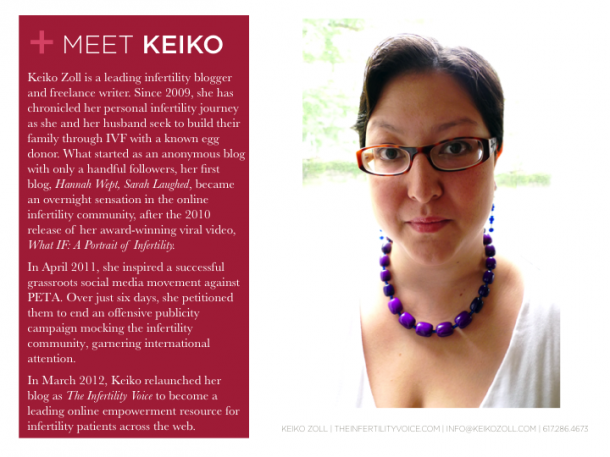 Keiko Zoll is a freelance writer and author of two eBooks at her blog, The Infertility Voice. You can find her latest eBook, THE YOU PROJECT at her social media marketing and design website, Words Empowered. 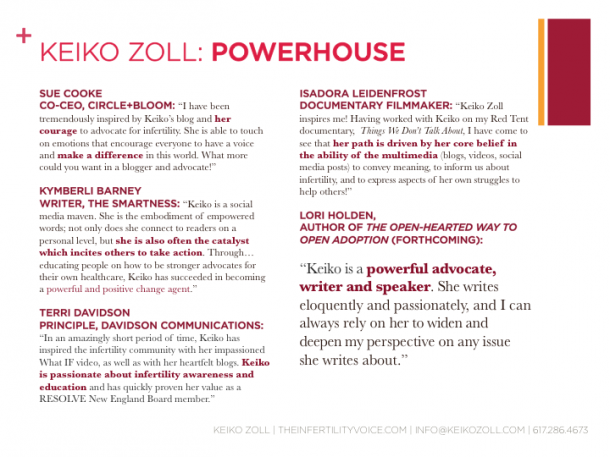 Keiko and her blogs have been featured in REDBOOK Magazine, The Huffington Post, Metro News International, WBZ-TV Boston, The Toronto Sun and will be seen in a forthcoming episode of The Katie Show this October on ABC. this is awesome information ver well put together and easy to understand…Thanks So Much!